With 27 days left until Christmas (WHOA! ), if you haven’t wrapped up your festive shopping then you’re probably in a mad panic about what to buy. Well, hopefully I can assist today with my Gift Guide featuring Christmas Gifts for HER under R500. Be sure to also check out my gift guides for her this festive season, with great ideas for gifts under R200 and under R350. If you’re looking for the perfect gift to satisfy the fashionista at heart, give her a copy of Megan Hess’ new A5 coffee table book; Iconic: Masters of Italian Fashion. It’s not a GUCCI bag or a pair of Dolce & Gabbana sunglasses, but it is filled with beautiful pages that will definitely bring a smile to her face. Megan Hess, whose illustrations have been commissioned by some of the worlds top fashion houses, captures the essence of designer luxury with 191 beautifully illustrated pages. This little treasure has everything you need to know about, as the title suggests, Masters of Italian Fashion… GUCCI, PRADA, DOLCE & GABBANA, GIORGIO ARMANI, MIU MIU, FENDI, VALENTINO, VERSACE, MISSONI and EMILIO PUCCI. The gold foiled pages make it even more beautiful in person, so you’re likely to end up picking up a copy for yourself. Ya know I love my Le Creuset pieces and if you’re buying a gift for someone who loves to cook/ bake/ just be awesome, then a Le Creuset Double Oven Glove is a great gift that will make her love her time in the kitchen – just a little bit more. I know that spending R500 on an oven mitt is crazy! I know! But, here’s the thing… If you buy quality, it will last. I have the single Le Creuset Oven Mitt and I’ve had it for about 6 years already and it still looks great! Who doesn’t love gin – am I right? 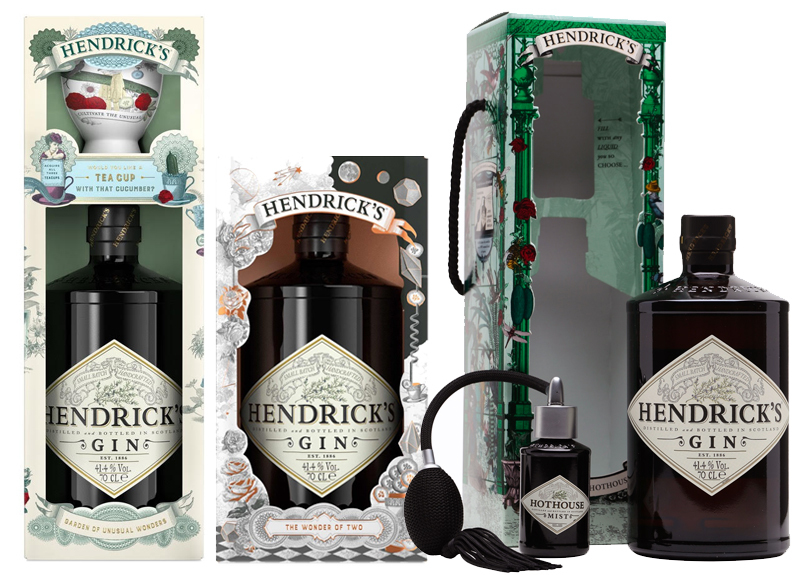 Now, if you’re buying a gift for a true gin lover, Hendrick’s Gin is one of the best to buy! Not only does the gin taste amaze (and one of my two fave gin brands), but every year Hendrick’s Gin releases a limited edition GIN GIFT SET that makes for the most beautiful gift – for girls and guys too! Last year, it was the Secret Order gift set, which came with a limited edition, Gin Tea Cup. This year, Hendrick’s Gin have launched the Garden of Unusual Wonders which once again, comes with a limited edition Gin Tea Cup and is packed in a beautiful box, illustrated with recipes on how to make Cucumber Basil Mash, Hendrick’s & Tonic as well as Flora Dora… it’s all about Cultivating the Unusual. But wait, there’s more! In addition to what I hope will be an annual limited edition tea-cup gin set, Hendrick’s Gin have also got two more Gin Gift Sets this festive season. The Wonder of Two Gift Set and The Cucumber Hothouse which comes with a miniature atomiser ready to be filled with anything that your heart desires. All three sets are available for a limited time only and retail for R399 each. Fun, gigantic pool floats are big business. Every one wants one of these, and if you have a friend who still hasn’t managed to get on board, then now would be a great time to gift her with an awesome pool float. 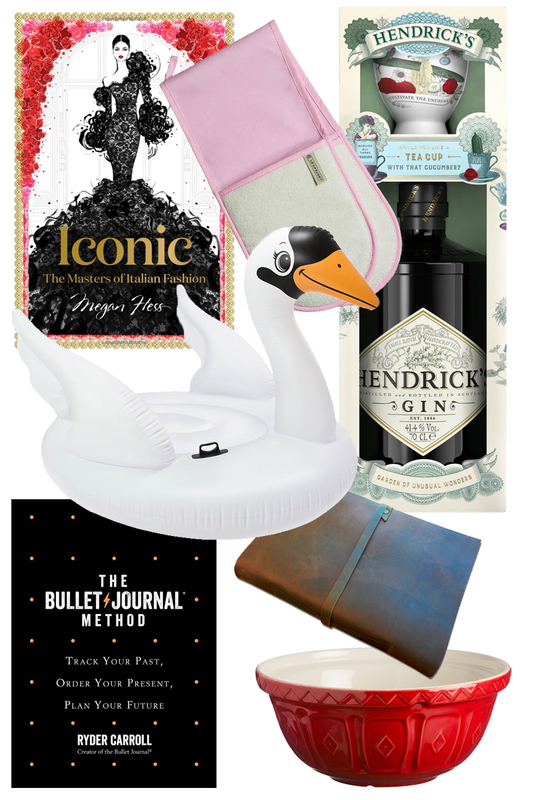 The Giant Swan is probably T-H-E most lusted after pool float. I received one last year as a summer gift from Ford, and I love it so much. So has everyone who has seen it. “Where did you get it from” always comes up and to be honest, I had looked and looked to try find one that was mega huge so that I could direct people who asked. I managed to find this one online, but also saw one with a slightly different swan face (more like the one I have) at Westpack Lifestyle recently. It’s a great gift and one that fits perfectly under the R500 mark! Of course you can get smaller ones that are more like swimming tubes than a lilo, but trust me, the big boy is the one to get! 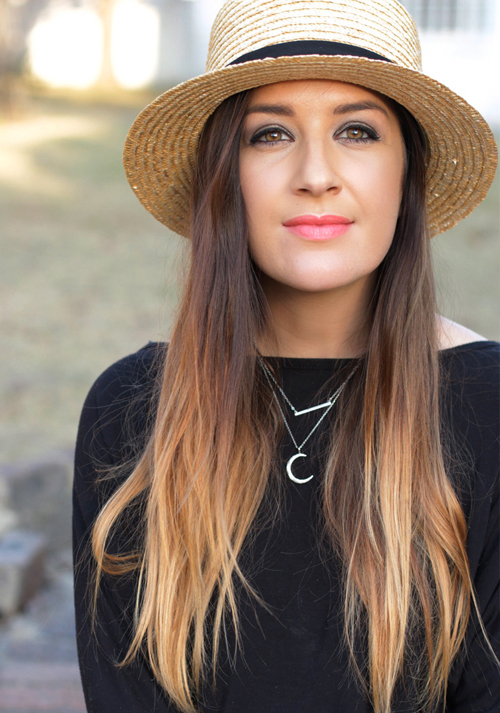 Getting organised is high up on my priority list, and if you have friends who want to go into 2019 with a clear plan ahead, then they will love Rhyder Carroll’s long awaited book The Bullet Journal Method. Carroll is the creator of the Bullet Journal method that has taken the world by storm, and in this book, he explains is system and how to use it to Track Your Past, Order Your Present and Plan Your Future. As a writer myself (not just saying that becuase I blog, but I’m a qualified Journalist too), I’ve always found writing and putting pen to paper to be very therapeutic and beneficial. Writing helps me to organise my thoughts and my life. But I know that not everyone is into writing full pages the way I am. Still, I do believe that writing things down can make a huge difference in your life, and that’s why I think the Bullet Journal Method is absolutely amazing for writers and non-writers too! It’s quick and easy! Plus you don’t have to string together fantastic, thought provoking or eloquent sentences to feel inspired by your own pages. A bullet journal captures short snippets of your thoughts and lets you write them down and illustrate them to your hearts content! Make a wish-list, set goals, create reading lists, priortise goals… what ever you do it’s about writing them down and The Bullet Journal Method is a beautiful hardcover book filled with all the tools you need to get you started. “The Bullet Journal Method is a rallying cry for those seeking a life of simplicity, productivity and purpose”. If the Bullet Journal idea set off sparks, then a beautiful, old school Leather Journal will surely make your heart sing! For travellers, for lovers of pen and paper, for admirers of old school charm, a Leather Journal is on everyone’s wish list – even if they don’t know it yet! I have wanted one of these for ages. I looked and looked and looked and finally found one, locally made to boot. I was so excited, I bought two! One for me, one for hubby and I know they will make great and totally unusual gifts! The thing about this A5 Leather Journal is that it’s legit! As in it looks and feels like the true old school journals; the kind travellers, explorers, geniuses and artists had back in the day. Back in the day before mass market, cheap, made in PRC junk bombarded our ideas of tradition and quality. A journal is an awesome thing to have, but a beautiful, thick and high quality leather journal is even better! This one from Cape Town based Worlds of Wonder comes bound in a true old school way of using string. There are a couple of booklets inside, each one “attached” with a string to form a really nice, thick journal. The bonus of this method, is that no matter where you write in your journal, each page opens up properly so you can write or draw without discomfort. Inside, there are 120 pages of thick 130gram acid free paper with no lines; so you can sketch, write or use it as a scrap book to paste things inside. It’s hand made (giving it even more charm) and covered in plain brown A-Grade leather which closes with a leather string. Last on my festive wish list for gifts under R500 is this Mason Cash 29cm Mixing Bowl. You’ve probably seen this iconic bowl in old movies or perhaps in your grandmothers kitchen when you were a kid? Well, thanks to the brand being “revived” again, you too can own a piece of these beautiful, classic and iconic mixing bowls. They come in a range of fun colours; from Red to Black, Azure to Turquoise and even a fun Lime. But if you want to keep tradition going strong, you can also purchase Mason Cash bowls (of different sizes) in the Original Cane colour. Such a beautiful piece for the kitchen that has been in use since 1901.